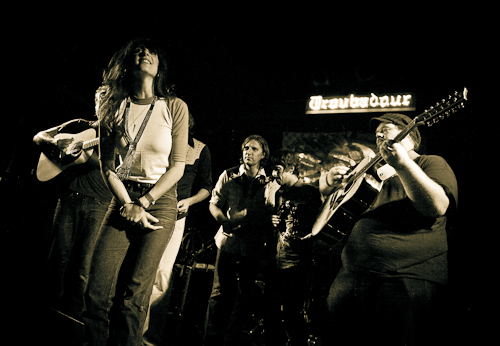 The Troubadour is LA’s gem – one of the birthplaces of the West Coast folk-rock-soul scene, having hosted the likes of The Byrds, Neil Young, Linda Ronstadt, and James Taylor. It is in this tradition and without surprise then, that Nicki Bluhm & the Gramblers carried the torch at this historic venue Monday night. Bluhm’s voice is equally sunny and strong, earnest and impassioned, and occasionally brings to mind favorite old Dusty Springfield jams. The San Francisco band resonates with both cool soul and country warmth, and is stocked with some of California’s finest musicians, including lead guitarist Deren Ney and renowned songwriter/producer Tim Bluhm (The Mother Hips). Fellow SF band, The Brothers Comatose, opened the night. Photos and words by Abby Linne.